-Grimm Tales by Philip Pullman, because who can resist such a pretty book filled with fairytales??? I sure can't. -One Good Earl Deserves a Lover by Sarah MacLean, ALL THE EXCITEMENT! 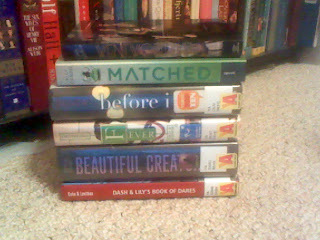 I LOVE Sarah MacLean's books!! 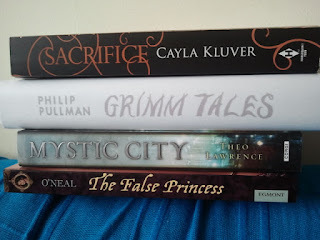 From the library: As I think I've said before, I'm always a year or two behind on my YA reading, so most of these are oldies, but they are new and exciting to me! Bossypants by Tina Fey - I ADORE Tina Fey and 30 Rock is basically my 4th favorite television show in existence. I can't wait for this one (even though the cover slightly freaks me out). Given to me: Daisy was nice enough to send me two books for my birthday earlier this month, for which I was so grateful and excited! I am just waiting to return the favor for her! Bookish altruism is the best sort of giving. Wentworth Hall by Abby Grahame - I feel like this book is basically Downton Abbey in book form. Yes please! In other bookish news, I got a Kindle Fire last week! It was supposed to be a present from my mom when I graduated in May, but we procrastinated a bit. I'm still figuring out how everything works, but I love it so far! Dash & Lily's book of Dares is one of my FAVORITES, SO GOOD!! I almost bought "The False Princess" the other day!! I hear great things about it...have you read it yet?? And oh my goodness Before I Fall... Please stock up on tissues and maybe some floaties so you don't drown in your own tears... Oh that book changed my life!! GREAT haul!! Can't wait to hear your thoughts on these books! Aww both of you got some great books! I can't wait to hear what you think about Mystic City Daisy! Thanks! I'm really looking forward to reading it! I think as bloggers we can get a bit caught up in reading the latest releases so it's great to spend some time with the oldies. I'm dying for Grimm Tales to magically appear in front of me. Matched is sooo good! Enjoy your books this week! I think one of the things I most enjoy is picking out which books to give to my friends :) Hope you enjoy Wentworth Hall and Matched! I definitely enjoyed Match! I think I'm going to save Wentworth Hall to take on vacation in December. Yours will hopefully be on its way soon! I love Before I Fall. It is such an amazing book and such a great introduction it was to Lauren Oliver. Enjoy it! What great hauls! I see Grimm Tales! I really want this book myself!